It was Tuesday, Book Therapy Tuesday, the day reserved for going to the book store and purchasing books that will give me the “Calgon take me away!” feeling I so desperately needed. But I didn’t have a book in mind and went searching the internet. 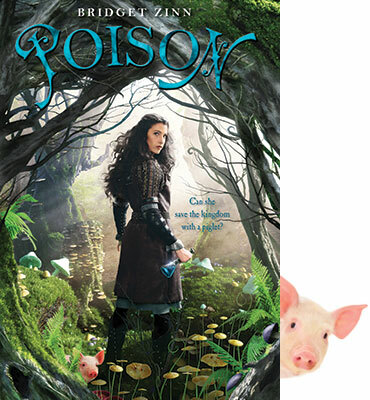 Then I found myself face to face with the gorgeous cover of Poison by Bridget Zinn, and it’s irresistibly too-cute tag line “can she save the kingdom with a piglet,” and knew I had to purchase this book. Later, while on Twitter posting a picture of my glorious book prize, I found out three things that would impact me. One was that this book was the author’s debut novel. The second was of Zinn’s untimely passing. And the third was about how the author community was coming together to honor Zinn by helping to promote Poison. It is a most thrilling thing to see the author community rally around one of their own. Most of us are aware that the life of an author is often times solitary because we work long, hard hours to get novels written and published. I’m one of those brand new, hard-working, solitary authors with a debut novel of my own called Blood and Honor. But I’m not here to tout my novel. You can read more about Poison and Bridget at http://www.bridgetzinn.com. Sixteen-year-old Kyra, a potions master has done the unthinkable — she’s tried to kill Ariana, her best friend and the kingdom’s Princess all because of a vision she doesn’t quite understand. Now she’s on the run though still determined to carry out her ill-fated mission. She’s had to swallow her pride and ask Master Criminal Arlo Abbaduto for his help in finding her prey but all she got for her trouble is a Katzenheim pig, said to be the best person-tracker in all the land. Definitely not the kind of help Kyra was hoping for. But at the moment she’s fresh out of ideas and has no choice but to make the best of her situation. On her journey with the pig-she-refuses-to-give-a-name, Kyra meets the handsome, dashing Fred and his dog Langley. Fred seems to get in her way at every turn, infuriates her to no end, but she can’t stop thinking about him. And to make matters more complicated, he names her pig Rosie without her permission, and Rosie and Langley have bonded. This book reminded me of my childhood, all those fun, adventurous books my mother couldn’t pry me away from, the ones I conned her into buying, and the one author solely responsible for getting me on the reading bandwagon – Enid Blyton. A beautiful, clean, well-written story filled with strong-willed, charismatic, independent, driven, witty characters that co-exist well with each other like Kyra and Ariana. Then there is handsome Fred, who is really the Prince of Arcadia and who is engaged to Ariana, yet seems to be thoroughly smitten with Kyra. He sets out on his own mission to find and capture the “Princess Killer.” But all sorts of mayhem ensue which has the opposite effect and helps the characters work together to solve the mystery. While I enjoyed all the characters, my favorites were the beloved animals Rosie and Langley. The way Zinn portrayed their cute and cuddley relationship in just a sentence or two was so powerful, endearing and quite loving, it felt right and true. Each turn of the page or mention of either animal had me almost breathless and I was stricken when Rosie was attacked by the wild dog, and despondent when she was given away. When Kyra realized how unhappy she was without Rosie and reclaimed her, I was thrilled. I tried to read slow but couldn’t and as the story ended and the mystery solved, I was left with a deeply satisfied, nostalgic feeling. Poison is an exciting, adventurous, fun story with down-to-earth characters, rich world-building and a precocious pig that captured this reader. This entry was posted in Books, new release and tagged action/adventure, DRAMA, mayhem, mystery, pigs, ya. Bookmark the permalink. Thank you so much for your wonderful review of POISON. I can tell by how you talk about the characters – how much you enjoyed spending time with them in Bridget’s novel. Rosie has definitely captured the hearts of readers, but it’s fun to see your comments about Langley as well. I’m so glad the book found the right reader. Thank you so much for helping us share POISON with new readers. It means so much to me and Bridget’s family. Wishing you the best of luck with your own writing.